1. 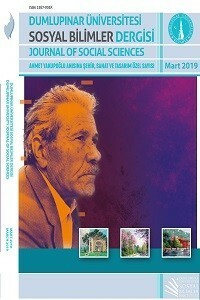 Dumlupınar University Journal of Social Sciences is double blind peer-reviewed journal and is published quarterly (four times a year) in January, April, July and October. Manuscripts can be submitted both in English and in Turkish. 2. The manuscripts which are sent to Dumlupınar University Journal of Social Sciences should not be published elsewhere or should not be submitted for publishing in printed/electronic medium. In case of the submission of the manuscripts that are presented toand/or accepted for peer reviewing process by Dumlupınar University Journal of Social Sciences and to other media at the same time, and detection of a similar or same paper/article published in another media the process will be cancelled. The institutions that the author/s is/are affiliated to will be informed. 3. The journal publishes original papers/articles on social sciences including economics, politics and international relations, public administration, business, economics, finance, literature, sociology, history and fine arts. 4. The manuscripts will be assessed via "TÜBİTAK ULAKBİM DergiPark Manuscript Submission System". The submissions are accepted at http://dergipark.gov.tr/dpusbe. 5. The manuscripts that are submitted to Dumlupınar University Journal of Social Sciences are subjected to preliminary review. The manuscripts which are found appropriate of form and content are presented to editorial board to assign a referee. The editorial board will decide in 4 weeks whether the manuscripts, which are submitted to Dumlupınar University Journal of Social Sciences, will be peer reviewed or not. 6. The manuscripts which are uploaded to JournalPark system will be checked for plagiarism with “iThenticate” plagiarism detection programme. The manuscripts which are more than 20% identical with other articles will be editorially rejected. 7. In case the manuscripts, which are anonymously evaluated by the editorial board, are accepted the referees are assigned and each manuscript is sent to at least two independent reviewers as an anonymous text. 8. If revisions are requested from the author as a result of peer reviewing process, these must be made within the period (in one month) to be specified by editorship and sent to the editorial board. Otherwise the manuscript will not be assessed for publication. 9. At the beginning of all submitted manuscripts, Turkish and English title, Turkish and English abstract should be included. Abstracts should not exceed 200 words. In abstracts, attention should be paid to the inclusion of purpose, method, findings and conclusion of study There should not be a quotation or reference in abstracts. Key words should be written in English and Turkish below abstracts parts. Abbreviations should not be used in abstracts. Key words should preferably be chosen from the indexes of the field. Abstract should be written in 10 font size with Times New Roman, aligned on both sides and fit on one page. Title of “introduction” should start at the other (the second) page. 10. The type of the manuscript (research paper, case report, review paper, etc.) should be indicated during the submission of manuscript sent for publication to Dumlupınar University Journal of Social Sciences. 11. The title of the manuscript must be written firstly in the original language, then on the other language with 12 font size, capital letters, bold font style, and centred on the page. Titles of abstract, keywords and JEL codes should be written in 10 font size, with first letters capitalized, other letters lower – case, boldface type and left – aligned. If the study has already been presented, produced from a project or a thesis, the footnote (*) should be placed at the end of the title of the manuscript and explained. 12. In the manuscripts included in JEL (Journal of Economic Literature) classification, at least one and at most three JEL classification codes should be added. For the JEL classifications that should be chosen according to the topic of the manuscript, please visit to http://www.aeaweb.org/econlit/jelCodes.php The JEL classification codes will be given below the Turkish and English abstracts. 13. While submitting a manuscript to “DergiPark Manuscript Submission System” the communication form should be filled alongside wet-inked signatured copyright form and manuscript submission form. These forms are on the web page of our journal and on the submission system. If any survey, focus group discussion, interview etc. related data is used in the manuscript that is submitted to Dumlupınar University Journal of Social Sciences during the submission process, a permission document and/or ethics commitee approval received from the relevant institution must be uploaded. 14. Below the title of the manuscript, the full names of the author(s) should be right – aligned and written in such a way that the first letters are capitalized and the other letters are lower –case. By adding footnote to author(s) names, title, institution and contact information of author (s) should be included in footnote. 16. Submitted articles must be written before and after 6nk and single line spacing. It should be up to 20 pages and A4 size with tables and figures. The article should be prepared using 12 punto, Times New Roman and Turkish font. The page structure that is used while writing should be distanced from the bottom and top 2,5 cm, right and left side by 2 cm, left side by 0.5 cm from the left side and aligned at both sides. Odd and even pages should be different, upper and lower information should be 1.25 cm. 17. The title classification in the text is done with numbers. Such as 1, 1.1., 1.1.1 .; 2., 2.1., 2.1.1., 3., 3.1., 3.1.1. The 'Introduction' and ‘References’ titles will not be numbered. Except to the main titles of Turkish and English (Times New Roman, 12 point, bold and center), the first letter of the other titles should be written capital letter and others small in bold and left-aligned format. 18. The page number should be specified in the sub-middle part of the article. 19. Articles submitted for publication should not contain paragraph indents in the text and titles. 20. Articles submitted to Dumlupınar University Journal of Social Sciences must conform to the form indicated by the journal's figures, graphics and tables. Sub-notes, charts and tables should be included on the cited page or immediately after the page. The notes under the graphics and tables should aim to make these materials understandable without regard to the main text. Table and figure headings should be written in left-aligned, bold and numbered order ("Table 1:" or "Figure 5:" ...). Table and figure titles should be italicized (Example: Table 1: Number of Film Taken and Displayed between 1989-1996). The tables and figures should be left-aligned and the text shifting feature turned off. "Note" written under the table should be written in italics. The equations and formulas which are used in the body of the manuscript should be numerated. 21. The entire References should be prepared with Times New Roman 12 font size, single line space, and with 6nk before and after the paragraph. Every entry in the References should be on 1.25 cm. The text should be aligned on both sides. 22. Each appendix provided in the article must be submitted on separate pages after the references. Titles must be written in bold, capital letters, and left-aligned (such as "APPENDIX 1:"). 23. If the article has a footnote with explanation and refers to any source in the footnote, it should also be indicated on the references. The sources that are not used in the body text should not be referred in the References. 24. In the articles, the writing guidelines and the writing rules of the Turkish Language Institution should be taken as an example. For detailed information, please refer to Turkish Language Institution's web page: www.tdk.gov.tr. Instead of foreign words, Turkish words should be used as much as possible. In the first place where Turkish unfamiliar words are used, foreign correspondence can be given in parentheses. Foreign words in the text must be italic. 25. The articles sent in English and the parts written in English of the articles sent in Turkish must be passed through a competent language check before submission. Regardless of the content, articles that are insufficient in terms of language are returned / rejected. It is important that authors pay utmost attention to this matter. 26. The authors are responsible for the ideas expressed in the articles. 27. The authors of the manuscripts accepted and published in the journal (written and electronic media) are deemed to have transferred the copyright to Dumlupınar University. 28. All communication about article presentation and evaluation processes is done with DERGİPARK system. No information is provided by phone. 29. If the submitted articles do not comply with the above-mentioned conditions, an editorial rejection will be made without being introduced to the process. -1. file should be the original file (MS WORD format) which contains the information about the author. - As Dumlupınar University Journal of Social Sciences uses double blind peer review system 2. file should not have any information about the author. Additionally, the personal information should be removed from the Word format.